STANDARD Codecs is a package of a number of different (and popular) audio and video codecs for Windows users. 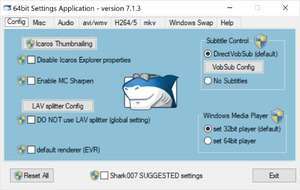 As most codec packs do, STANDARD Codecs will provide you with the capability of playing many different video and audio formats not typically supported on Windows. This can include anything from MKV to XVID and more. STANDARD Codecs also provides you with the relevant tools to view thumbnails inside of your media folders where previously only icons were shown. Version 7.8.1 is a freeware program which does not have restrictions and it's free so it doesn't cost anything. For security reasons, you should also check out the STANDARD Codecs download at LO4D.com which includes virus and malware tests. Additional screenshots of this application download may be available, too.